Well what do you know, another Friday has rolled around! Looking back to last Friday, I see that I wrote about beer and that made us all happy, so perhaps we should talk about Beer on Fridays more often. And lucky for me, I have some pretty exciting beer-related stuff to share today. After last Friday’s article came out, a discussion ensued in the comments section. 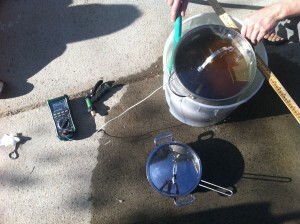 Several wise MMM readers brought up the idea of brewing one’s own beer. I thought this was a fantastic idea. So I teamed up with a few local gentlemen and we discussed our limited knowledge on the subject, over a few beers. Apparently, the beer you make at home can be top-quality as long as you use good quality ingredients and handle the fermentation stage carefully. And, of course, water from a Glacier-fed Rocky Mountain Stream. Luckily, I have this on tap at my house. With a quick comb of Craigslist, we scored the capping machine and the bottles, along with assorted tubes and accessories, for only $5. A second Craigslist purchase led to the 5-gallon Carboy along with the special venting cap. This was more pricey at $20, but still reasonable. And I already had the giant cooking pot from my Chili-Making habit. For the ingredients, I discovered that there’s a home brewing shop called the Bald Brewer right near my house. So I biked over and obtained a beginner-style ingredient kit for $40. (Upon further research, I discovered similar kits are available online through Amazon.com, but hey, it’s good to shop locally sometimes and the Bald Brewer himself gave me some great tips on getting started). – cool it all back down and transfer it to your well-sterilized glass carboy for fermentation.. and dump in the included packet of yeast. – throw on the cap and ‘Stash it in your basement for 7-10 days. That’s as far as we’ve gotten so far. As of immediately before writing this article, the 5-gallon jug in my furnace room looked and smelled very healthy and beer-like. It was bubbling cheerfully as the yeast converted sugar into alcohol and carbon dioxide. After the 7-10 days, you can transfer it to a second glass jug for “secondary fermentation” (which gives you clearer beer because you leave behind some of the sediment(?)). Then after an additional couple weeks, pour it into sterilized bottles, apply caps, and throw it in your fridge! To make this process more efficient on a time-per-beer basis, we’re planning to Craigslist a few more glass jugs and another cooking pot. This will allow multiple batches of different types of beer to be brewed in one session. Then you will get hundreds of beers per batch, and you can rotate the brewmaster task among the various members of your beermaking club. With enough surplus beer, you could even begin bartering with neighbors who are better cooks than you are, for nice pre-cooked meals and such. Next update: The transfer to secondary fermentation next week! Fun! Maybe Matt would be interested in this! For me? I’m into canning jams for teacher/doctor/therapist gifts (that’s a total of at least 20 people). This year, I’m adding pickles and homemade pasta. But I’m sure they would also appreciate some beer! I began brewing at home a year ago, and I love it. Unfortunately, in a non-Mustachian fashion, it just led me to drink more on a regular basis. So, instead of replacing more expensive store-bought beer with less expensive mini-mustachian grown beer, I just buy and drink it all. This is the splurge area in my budget, though. What type of beer did you make on this try? Good point! I should definitely update that article to include the type of beer – it’s an insult to the beverage to just refer to it as “Beer”. This is a dark Amber ale called “Eighth Avenue Amber”, named after the location of the brew shop. The Bald Brewer tells me it is an easy-drinking summer-compatible beer, but still with a rich balance of maltiness and hoppiness. So, definitely not Budweiser or Coors, as you can already tell from the pictures. I have a good friend who brews his own beer here, and it’s AWESOME. Way tastier than most you can buy. His batches are on the small side though. He uses hops that were grown locally and organically under the sun by another friend of ours. Did you know you can grow your own hops and barley to make even better beer, for even cheaper? And you can keep them in your freezer so you can brew year round. Our first batches were mediocre, but we later improved. It takes some practice. I also know someone who brewed mead at home (it took a ton of honey). He then took the poorer batches of mead and distilled them to make liquor which was much better. I brew mead! I’ve done 4 1-gallon batches so far, probably will do a larger 5-gallon one some point soon. It’s fun and even easier than beer. That sounds excellent – I love the brown and amber ales. My brother started brewing about a year ago and has made some terrific brews. I especially love that you found the equipment on Craigslist and hence could probably re-sell it for the same price. I hesitate to even call Budweiser or Coors a “beer”. Unfortunately I live in Anheuser-Busch territory so it is everywhere around these parts. At these shops you buy the kits and dump the ingredients into their containers. When the beer or wine is ready you go back and bottle it yourself on their equipment. Still a bargain but maybe not as much fun as the all-at-home method. Saves time though. I know we have a couple of these types for beer-making here in MN. A subset of my wifes softball team does it every year. Will you be using standard 12-oz bottles, or “big boy” 22-ouncers? I used to brew in college (great way to obtain beer when underage!). I realized that the total time per batch was about 5 hours — including buying ingredients, disinfecting everything, brewing, and bottling. Not a good ROI on your time, so only worth doing if you view it as a hobby rather than a way to save money. I highly recommend kegging rather than bottling — saves you time and hassle, for just a tiny bit more cost per batch (for CO2). You should look for a Hydrometer too. A new one will only cost about $7 (and last for years) and it not only let you find out the amount of alcohol in the beer but gives you an easy way to tell when it is ready to bottle. Also, although the kits at the local store may be more, once you start making your own reciepes and buying malt, hops, yeast, etc. the local store is cheaper. If your group makes a lot you may be able to buy in bulk for savings. ( this year I got a 55 lbs container of dried malt, and divided it into smaller containers saving about $5 per batch) Plus, the advice that they can give is very helpful when you are starting out. I recommend, once you have bottled and capped 12 oz bottles, that you buy 32 oz bottles – http://www.midwestsupplies.com/case-of-12-32-oz-ez-cap-beer-bottles-amber.html or a kegging system, if you continue doing this. I’ve brewed several times, and sanitizing and bottling are the most time consuming and least enjoyable process to me. Just be careful about the 32 oz bottles bursting, that happened to me, probably due to premature fermentation and too much carbonation. 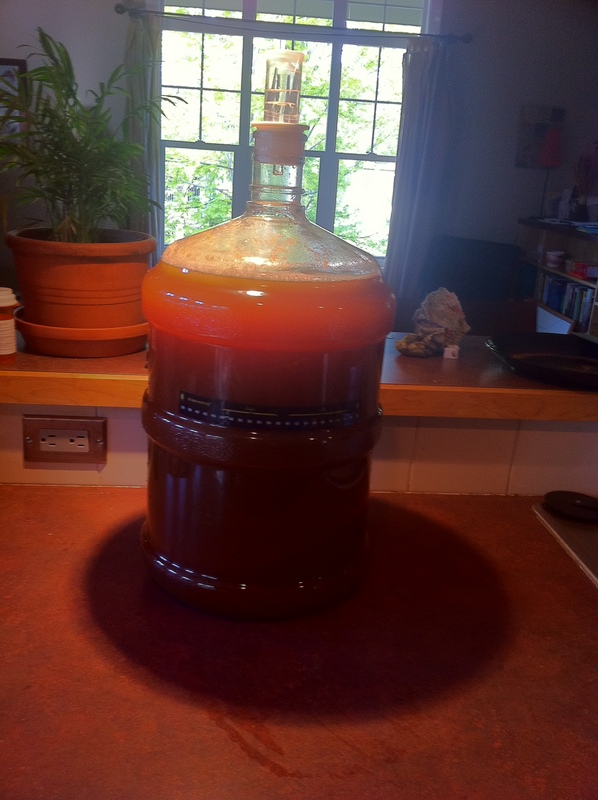 It looks wonderful, I make my own wine and have wanted to try brewng up some beer or mead but for some reason I chicken out and stick with wine making! Nice! Our current cost per bottle is $0.66 for a hoppy Imperial Stout. And it is one of my favorite beers….one of our friends calls our beer Super Duper so that is what we call it too. Happy bottling! And then happy drinking! Were the malted barely grains you “steeped” cut fine? Helps in getting full flavour out and after makes great bread baking ingredient….beats the heck out of post soy milk okara I have to work to slip in to baking. Malt bread….mmmm. Hey Brian, thanks for the tips. I could go with plastic bottles as long as I was willing to pour the beer into a glass before drinking every time.. Since drinking beer directly from plastic is just wrong :-) …Also, if you use 1L bottles, don’t you have to drink a whole liter at a time to avoid having the rest go flat? I usually drink only a single beer unless it happens to be Party Time. Finally – neat idea about using the barley for bread. I do bake my own bread so I will read up on that idea. The 1 liter vs 500ml standard bottle is more ease of filling. With screw top and natural fermentation you can pour a glass, replace cap, back in fridge and it will be fine for next glass. I do pour my beers into a glass as do not have pressure filters, so to leave last bit with cloudy yeast sediment behind, I decant so to speak. Even filtered well, if aged long enough to get really smooth, there will be sediment. Hey what happened? Did you drink too much and forget about your blog? If you up your equipment outlay a bit, your per-batch consumables cost goes waaay down by brewing from grain rather than concentrates. I did a 10-gallon batch of Heffeweizen-like beer this summer and if I remember correctly my ingredient cost was about $.60 per 22-oz bottle. Would love to hear you give a talk about living a balanced frugal life at some point in the future – anyone who wants to talk about their passion is warmly welcomed by the community! 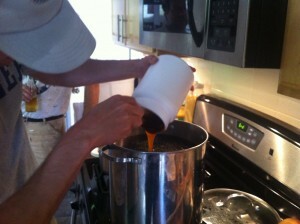 I finally convinced my hubby to try home brewing last year. Our budget has always been $20 a month, each, out of our own pocket money, for alcohol. This buys very little of the imported and craft beer that we like(about 2-3 a week, each). My hubby cannot cook anything so he wanted the simplest system to use. His dad got him to try using a Mr. Beer setup and we are amazed at how good the beer is! Shopping sales for the kits and added ingredients, a gifted capper and using recycled bottles got our cost down to about $.80 a bottle. We can now enjoy more beer, share with our friends and family and are still spending less than we were previously. Win-Win! On my site my husband is called Homebrew Husband for obvious reasons. I can’t abide store bought beer, even the craft stuff, anymore. There’s a freshness with well made homebrew that is superior to any industrial beer. One of the earlier commenters mentioned all grain and if you haven’t made that swap you’ll want to, both for price, quality and control of recipe. (I realize this post is ages old so likely you’ve already learned this.) A good kegging system is also loads more fun than bottling and makes for a more consistent product, and the components can be built up over time or wished for at the holidays if you are into that kind of thing. Long time stalker. Second time reading-all-the-way-through-er. Just noticed you still had a question mark next to the secondary fermentation. Not *only* does it clarify your beer, it can also help clear up some seriously funky favors. Yeast will create some things that taste nasty, but then in the absence of sugar they will consume the very thing they created. Anyway – I have certainly found that the two-vessel-fermented beers I have made have been stellar, so I think I’ll keep doing it. Appreciate the advice. I have a soda keg and a CO2 tank; it beats having to sterilize all those bottles and you can pour as much or little as you want. Usually, I find frugality and environmentalism are interrelated. By brewing, I reduce my environmental impact by reducing the number of bottles of beer I buy at the store that had to be shipped there. However, I have resolved that I can only brew in the winter here in San Antonio. I don’t want to get another refrigerator due to cost of the appliance and timer to keep it at the correct fermentation temperature and electricity especially keeping it in the 120 degree garage (no basements here). Keeping another refrigerator in the house won’t work that much better if I could find a spot for it since we don’t use AC in the house either. P.S. I am on the verge of quitting work in my mid-40s; I’ve got a solid plan for the first two years and a loose plan for the remaining years until I can tap into my 401K. 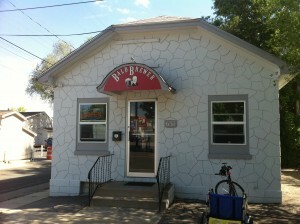 $30 overhead to get your microbrewery started is great! – I’m going to try this over the fall/winter. …but check out this guy’s (nano?) brewery that cost him nothing! By buying 50 lb sacks of malted barley you can save even more. You will need to do a mash which takes time and more equipment but having complete control over the entire process adds to the experience. Just finished brewing up 10 gallons of Honey Wheat and 10 gallons of Nut Brown Ale. I’ve been brewing about 2 years and I wanted to add a couple of clarifications to your post. First off you mention sterilization several times when in fact all that is required is sanitization. Sanitizing is a lot easier than sterilizing but maybe I’m just being picky. Also the secondary fermentation is really just letting the beer settle and improving clarity as you mentioned. In fact I wouldn’t recommend transferring a beer to secondary unless it had already finished fermenting. However it’s almost completely unnecessary unless brewing a “big” beer such as an imperial stout that requires aging. Clarity of beer is just aesthetic and not something you will be able to taste. As long as you leave behind the trub when you rack to your bottling bucket or keg you should have no issues at all. Also if you are still bottling I’m assuming you pour into a glass and are not drinking straight from the bottle right?! I know you wouldn’t want to be ruining the flavor by drinking the yeast that settles out in the bottle! If you’ve made the jump to all grain brewing I think that could make for an excellent post to all those who want their delicious homebrews even cheaper! The mash/lauter tun is a prime DIY/ craiglist item and the cost savings on barley vs malt extract are pretty significant especially for larger beers or batches. I started brewing last year and, so long as you can get your hands on good quality ingredients (non of the cheapo kits which were popular in the 80s…) the results are great. I haven’t made anything to quite compare with the top breweries, but it’s not overly time consuming, really fun and the results are way better than so-so. If interested, I strongly recommend John Palmer’s website ( http://www.howtobrew.com). Along with a stack of detail should you want to know more, the site has some easy to follow guides to brewing and bottling. You are 4 weeks from your own frugal, personally brewed happy juice. I second that recommendation, just enjoyed a friends homebrew and have my own cider bottled and ready to go. I’m still reading through the book and there is so much information in there. I’ve read the cleaning portion at least three times because it is very important to understand. I currently have a spreadsheet with my three batches so far and what is different with each. I bought a food thermometer so I could pitch the yeast correctly now, it also made our pork chops taste better, highly recommend one. Seeing how I’ve only done cider so far I also recommend http://howtomakehardcider.com. I combined what I learned from John Palmer’s book with what they teach there and have been successful so far. Thanks MMM for the tip of going to craigslist, might be getting a free fermentation chiller to use in future brews. Portland is known for their microbrewery’s and it can make craigslist scarce, other than the free chiller not much on there. I have been a homebrewer for over 10 years now and I enjoy crafting specialty beers at a fraction of the price! There are great beers out there don’t get me wrong but I enjoy crafting my own recipes. 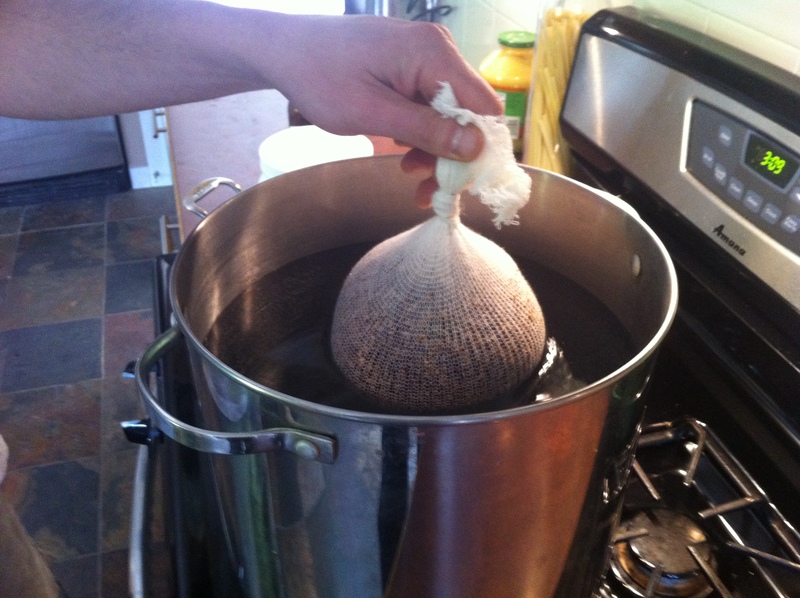 I am an all grain brewer and I actively pursue ways to save money in the process. I have built my own stir plate for a yeast starter, a hop spider to keep them out of the kettle and recently started yeast harvesting. 7.00 per yeast vial adds up! I joined a homebrew club and get a decent discount on grain. Happy brewing! We have been brewing out own kombucha since this winter. The startup costs have paid for itself many many times over. With a bottle at the store running for $4 it was easy! The kids absolutely love the stuff too! MMM, I am curious if you stuck with this hobby and are still actively brewing? I tried it years ago but got away form it after breaking a carboy (the clean up was a nightmare.) Back then it was more of a hobby. Now I am looking at it from the savings perspective to not have to give up craft beer in my financial optimization conquest.